Today is the Solemnity of St. Joseph, Husband of the Blessed Virgin Mary. 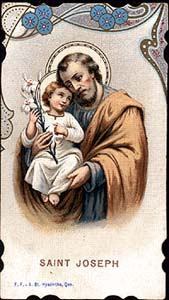 I have always looked to St. Joseph for the strength to be a good and chaste man. He is, after all, Mary's "most chaste spouse," and as the father of Jesus and the protector of Mary he is an ideal model of what it means to be a responsible husband and father. I hope to live as he lived: chaste, responsible, strong, courageous, skilled, loving, manly. I am so thankful that, in giving me my middle name, my parents made him my patron. I have done the same with my own son (Dominic Joseph), so that he will always have the intercessory power of St. Joseph to guide him and protect him. thanks for dropping comments into my blog (SELaplana) on my post about Peter. I actually replied on the comment you made. Maybe from time to time I can post a blogpost as comment of your blogposts. Shouldn't you be all of those things now, outside of marriage?